November 21, 2018 - Orange Beach & Gulf Shores, AL - (OBA®) - The Alabama Department of Public Health cautions the public that water samples collected from Alabama Point to Little Lagoon Pass in Baldwin County indicate the presence of red tide cells in the low to medium range. Persons with respiratory problems or those experiencing symptoms of nose, throat or eye irritation should avoid any mist generated by these waters. In addition, fish kills are possible in this area because of red tide. It’s time to Light Up Orange Beach! The annual City of Orange Beach Christmas Tree Lighting at The Wharf will be held Tuesday, November 27th. The festivities begin at 5:30 p.m. and will feature a program with Santa, performers singing Christmas Carols, cookie decorating, hot chocolate, and will culminate with the Wharf Christmas Tree Lighting. “Winter at The Wharf” features an ice skating rink that will add to the festival atmosphere. November 20, 2018 - Pensacola NAS - (OBA®) - Below is the 2019 Airshow schedule for the U.S. Navy Blue Angels. After many of the shows the Blues will buzz the beaches in Orange Beach on their way home on Sunday evenings. We publish estimated times we're expecting to see them on the OBA Facebook Page. November 19, 2018 - Montgomery, AL - (OBA®) - Governor Kay Ivey announced on Monday the National Fish and Wildlife Foundation (NFWF) has approved more than $48 million for eight new projects, which focus on the restoration and conservation of Alabama’s natural resources. November 19, 2018 – Orange Beach, AL (OBA®) – Just because Orange Beach is moving ahead with building its own Wolf Bay Bridge doesn’t mean officials there aren’t completely behind the state’s project to put a new bridge west of the Foley Beach Express Toll bridge. Orange Beach was well represented at the state's public hearing on Nov. 15 over a road and bridge project in south Baldwin County. A standing room only crowd packed into the Gulf Shores Activity Center and more than 40 came to the mike to express views on the products. Many more submitted written comments. November 16, 2018 - Gulf Shores, AL - (OBA®) - The Coastal Alabama Business Chamber is excited to announce the 33rd Annual Lighted Boat Parade happening Dec. 8, starting at 5:30 p.m. The parade route begins at Lulu's Homeport Marina, travels east past the Wharf, east to Bear Point, south to Ono Island, west to Perdido Pass, and finally north with a big circle ending in Terry Cove. The boats then can go to FloraBama Ole River Grill for an ending party and awards ceremony. November 15, 2018 – Orange Beach, AL (OBA®) – Congratulations! It’s twins for the Orange Beach Fire Department. Twin fire trucks that is. On Nov. 13 the Orange Beach City Council voted to spend $1.2 million to buy the Pierce pumper trucks from the Houston-Galveston Area Council. At the same meeting the council voted to buy two ambulances from the same company at a cost of about $600,000. Pearce said the council wanted to go ahead and approve the purchase to try and get the trucks in service before the next busy season ends. 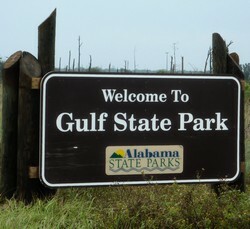 November 15, 2018 - Gulf Shores, AL - (OBA®) - Due to a saturation of golf courses in the region and the opportunity to provide new nature-based recreational opportunities at Gulf State Park, the Alabama Department of Conservation and Natural Resources (ALDCNR) officials announced this week that the Gulf State Park’s golf course will close in December. November 16, 2018 – Orange Beach, AL (OBA®) – Bill Howard is no stranger to winning. His Wild Bill’s Hot Sauce for wings has won a handful award in the past few years. During the recent World Food Championships at The Wharf, he added a first place in the Soup Or Bowl contest, one of three side contests entrants in the WFC’s main events were eligible to enter. November 13, 2018 - Orange Beach, AL - (OBA®) - Teaming Up for Character is a central theme for all National Association of Intercollegiate Athletics (NAIA) sports, showcasing the core values of integrity, responsibility, sportsmanship and servant leadership. As the top NAIA teams head to the Orange Beach Sportsplex for the Women’s Soccer National Championship presented by The Wharf Nov. 26 to Dec. 1, student-athletes will live out this character-focused program by collecting toys for the Christian Service Center. November 8, 2018 – Orange Beach, AL (OBA®) – Several iconic businesses from Orange Beach received statewide awards recently and were honored for those kudos at the Nov. 6 city council meeting. Among the winners were Cosmo’s, Cobalt, Wolf Bay Lodge, Perdido Beach Resort, Bill Briand of Fisher’s at Orange Beach Marina and Camille Baker of Perdido Beach Resort. The Alabama Restaurant and Hospitality Association, the Alabama Retail Association and The Partnership of the Chamber of Commerce Association of Alabama handed out the awards. November 8, 2018 – Orange Beach, AL (OBA®) – Orange Beach’s effort to start a city ambulance service is not in any way due to the service currently provided in the city from MedStar, Mayor Tony Kennon said. November 8, 2018 – Orange Beach, AL (OBA®) – Dale Beard was spending a busy recent Thursday morning getting the scratch-made salads, twice-baked potatoes, stuffed mushrooms and casseroles ready and stocked into the Meat Mart’s display cases. Husband Glenn was working on the next batch of house-made bacon by applying seasonings to the pork belly slab and getting ready to put it in the smoker. November 6, 2018 – Orange Beach, AL (OBA®) – Walking the beach in the early morning semi-darkness is routine for Skie Brown. She looks at the tapestry the sun paints on the clouds as it slowly rises out of the Gulf and snaps pictures and videos until it has completely freed itself of the horizon. She loves seeing the animals as well. On this Oct. 29 she thought there in the dawn light she saw a familiar sight. But there was something unfamiliar about it. November 5, 2018 - Orange Beach - Gulf Shores - (OBA®) - Here's our 2018 list of Restaurants open for Thanksgiving Dinner this year. You'll find links to additional details on each of the listings. The link on the restaurants' names will take you to their website, the link On OBA will take you to the restaurant's listing on the OBA Website. November 2, 2018 - Orange Beach, AL - (OBA®) - Cobalt The Restaurant won Silver for the Alabama Retailer of the Year in the Annual Sales $5 Million to $20 Million category. They tied with another Orange Beach restaurant, Wolf Bay Restaurant. Brian and Jodi Harsany, owners of Cobalt The Restaurant, were nominated by the Alabama Small Business Development Center – University of Alabama and the City of Orange Beach. October 30, 2018 - Foley, AL - (OBA®) - Foley Elementary School, along with area churches and organizations, is stepping up to help those in need in the Foley area. The Ninth Annual Turkey Take-Out is gearing up to feed an estimated 1200 people again this year, many of whom are the families of students at Foley Elementary School and the Foley feeder schools such as Magnolia Springs and Swift School, as well as Summerdale, Gulf Shores, and the Rosinton areas. October 29, 2018 – Orange Beach, AL (OBA®) – Choose sand angels over snow angels this holiday season on the Alabama Gulf Coast. From 65-acres of Christmas lights and lighted boat parades to Santa Claus parachuting down from the North Pole, there are plenty of joyful, family-friendly events happening this year during Coastal Christmas. October 26, 2018 – Orange Beach, AL (OBA®) – According to Yelp reviews, BuzzCatz Coffee & Sweets serves the best breakfast in Alabama. PEOPLE Magazine worked with Yelp editors to identify their online reviews that focus on breakfast. Those restaurants were ranked based on a variety of factors for their Best Breakfast in Every State. October 25, 2018 - Orange Beach, AL (OBA®) - The Gulf Shores Airport Authority and State of Alabama Bureau of Aeronautics is hosting the 2018 Aircraft Owners and Pilots Association (AOPA) Regional Fly-In this Friday and Saturday, Oct. 26-27, at the Jack Edwards National Airport. The event will highlight static displays of military and civilian aircraft, offer biplane and helicopter rides and feature more than 70 exhibitors along with seminars and an AOPA Town Hall meeting with AOPA President Mark Baker. October 23, 2018 - Gulf Shores, AL - (OBA®) - Gulf State Park and the City of Gulf Shores will implement a new speed limit on Alabama Highway 135, one of the gateways to the park. On Tuesday, October 23, the speed limit will shift to 26 mph. Public safety is the goal for the reduction in the limit from 35 mph, particularly in light of the increased use along the route for hikers, bikers, walkers and other park guests. New signage and radar reminders will be activated along Alabama 135 and there will be an increased presence of the Gulf Shores Police and Alabama State Parks rangers to enforce the speed limit, beginning at 7:15 a.m. on Thursday. October 23, 2018 – Orange Beach, AL (OBA®) – If there’s one person who’ll be affected most by Orange Beach’s effort to finally get a Wolf Bay bridge it’s Richard Schwartz, owner of the iconic Doc’s Seafood Shack and Oyster Bar. The ramp for the bridge will split two pieces of property he owns at ground zero, one where his restaurant sits and one where his customers and employees park. October 22, 2018 – Orange Beach, AL (OBA®) – A Go Fund Me campaign for an Orange Beach Elementary School kindergartner exploded over the weekend of Oct. 19-21 to surge past $17,890. On Oct. 17 it was just shy of $4,000. The campaign is for Annadelle Faulkner who began complaining with a variety of symptoms in the closing days of September but doctors couldn’t pinpoint the causes. She is the daughter of Neeli and Chris Faulkner of Orange Beach. October 18, 2018 – Orange Beach, AL – (OBA®) - It came from the sea and to the sea, it shall return. Tracy Arnette was taking a walk along Johnson Beach in Perdido Key recently and she saw a bottle washed up on the edge. She had found a message in a bottle that led her to unravel a mystery about its contents and the heart-wrenching story behind it. The message read: George Gumpert, October 24, 1982 – BETA. And a quote below over a picture of a dock over some water read: What do you do when you realize that the answer you’ve been chasing your whole life is really just the next question? Tracy found out that message was from a heartbroken George Gumpert whose son, named George also, who had taken his own life in September of 2010 at the age of 28. October 18, 2018 – Orange Beach, AL - (OBA®) – Several groups, businesses, churches and governments in Orange Beach, Gulf Shores and around the county are spearheading relief efforts for victims of Hurricane Michael. While most group are collecting cleaning supplies, hygiene items, first aid kits and pet needs, the City of Orange Beach is planning a special effort for first responders who are also victims of the storm. October 17, 2018 – Orange Beach, AL (OBA®) – Orange Beach is looking to spend about $107,000 to begin a redesign of the recreation complex at the northwest corner of Canal Road and Wilson Boulevard. “We’re trying to maximize that property to get the most out of it because it’s shrinking fast,” Mayor Tony Kennon said during the Oct. 16 regular council meeting. The council also had a work session after the regular session and discussed how the city will send help to Bay County, Florida in the aftermath of Hurricane Michael. What: Jack Edwards Airport is hosting the Aircraft Owners and Pilots Association’s last fly-in for 2018. AOPA’s fly-ins are designed to give AOPA pilots and other aircraft enthusiasts the opportunity to connect with each other, learn more about aircrafts and have fun. This event is open to the public. October 11, 2018 – Perdido Key, FL - (OBA®) - Those who live, work and play in the Gulf Coast may already know how lucky we are to be able to enjoy the most beautiful beaches, friendly community atmospheres and successful business ventures in our area. Being a part of a local Chamber of Commerce allows camaraderie and collaboration to business professionals and community members in the area where we strive to succeed and grow together. The Perdido Key Area Chamber of Commerce hosts a networking social every year to bring together the local Chambers in the area to commend the continuing hard work for our common purpose of promoting successful business along the gulf coast. October 13, 2018 - Orange Beach, AL - (OBA®) - The Orange Beach City Council will hold its regular meeting at 5 p.m. Tuesday, October 16th, followed by the Committee of the Whole meeting. Following are the agendas for the meetings. Please note that the information below may not be the most up-to-date information. For the full and most up-to-date agendas and attachments, go to https://orangebeach.novusagenda.com/agendapublic/.